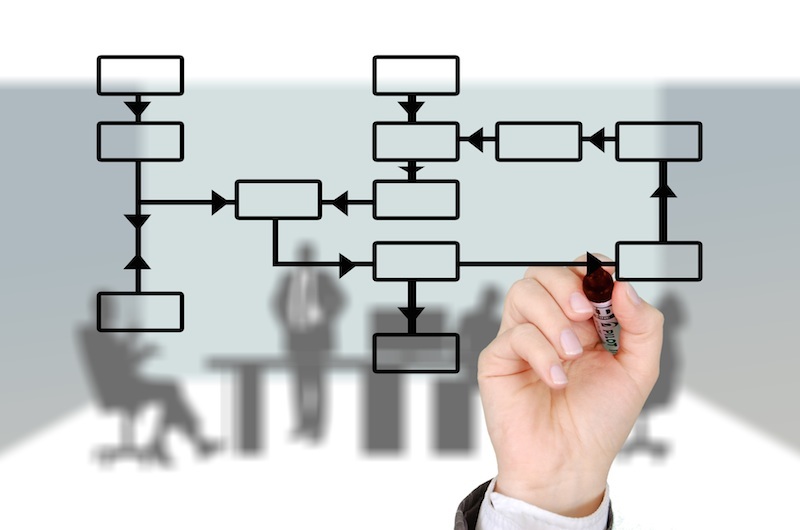 Project managers commonly use Gantt charts to track project schedules and visualize work breakdown structures (WBS). Some claim that Gantt charts are irreplaceable in project management and spend thousands of dollars on expensive Gantt chart software. But frankly, Gantt charts come with a series of fatal flaws that leave many managers looking for Gantt chart alternatives to meet their needs. Gantt charts are messy and hard to understand. 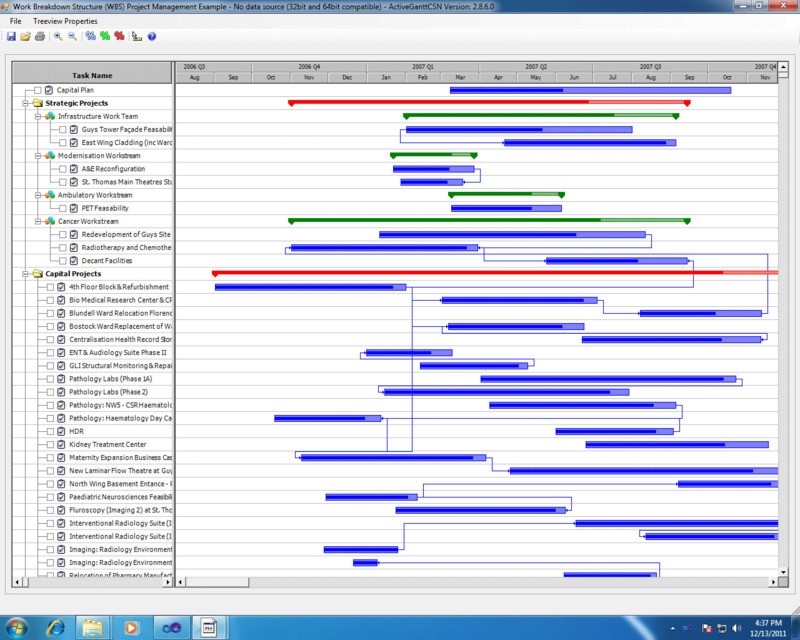 Once you’ve added dependencies, resources, milestones, and deadlines, Gantt charts become a massive eyesore. Stakeholders may have difficulty understanding your diagram without a headache. Gantt charts are inflexible. In the era of agile project management, it doesn’t make a lot of sense to use a diagram requiring extensive pre-planning when your plans are likely to change. Gantt charts require a lot of work to update. In conjunction with #2, when your plans do change, updating your Gantt chart to match them takes time and often slips through the cracks. For this reason, Gantt charts are frequently outdated and hinder effective team communication. Gantt charts often mean expensive software. If you buy project management software and only use it to make Gantt charts, you could save a lot of time and money by exploring Gantt chart alternatives. 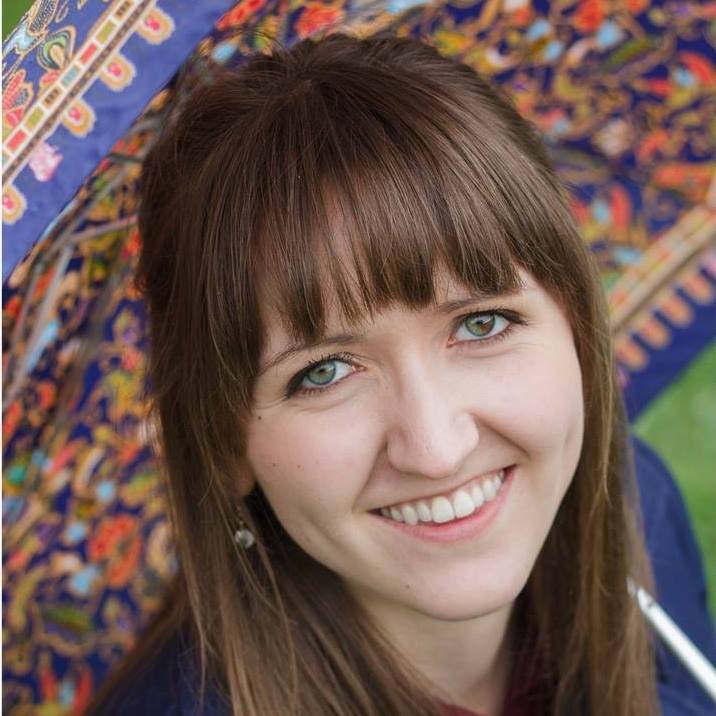 Gantt charts are difficult to build collaboratively, share, and print. Most project management software makes it difficult, if not impossible, to build Gantt charts collaboratively. Once you build them, they are difficult to print and share. If you find yourself nodding your head as you read this, it’s time for you to try Lucidchart’s Gantt chart alternatives. Lucidchart is a web-based diagramming app where you can build clean, professional diagrams that are flexible, easy to understand, and highly collaborative. And the best part? It’s completely free to sign up. To get you started, here are a few templates to use as Gantt chart alternatives in Lucidchart. Try using this project management timeline template in Lucidchart. It's easy to understand and can be modified quickly as your plans change. Simply adjust the start and end dates in your Lucidchart toolbar, then drag and drop project blocks and milestones to reflect modified deadlines. Some managers avoid network diagrams because they don’t like to rearrange boxes and arrows as plans change. However, Lucidchart allows you to share diagrams with your entire team so they can update the original document instantaneously instead of sending you revisions that pile up in your inbox. You don’t have to be overwhelmed with paperwork, nor do you need to sacrifice program flexibility by choosing project network diagrams as your Gantt chart alternative. Use this simplified example of a project network diagram as a model. Kanban boards can be built physically or virtually. Virtual boards like this one are optimal for teams that are separated geographically. In Lucidchart, you can even conduct your sprint planning together as multiple editors add cards to your board in real time. Change colors to convey additional information including project type. 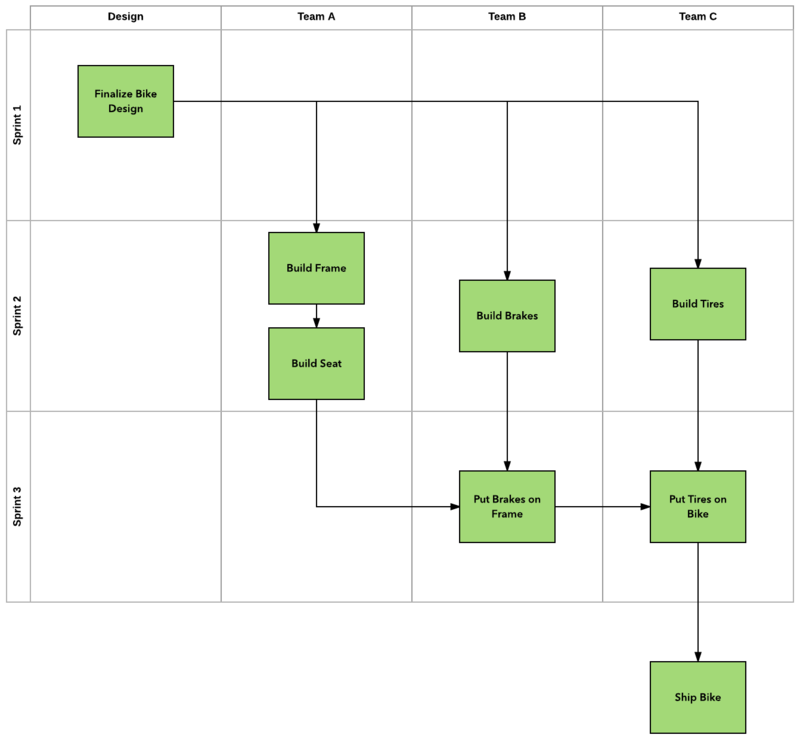 Cross-functional flowcharts use swimlanes to delineate responsibilities across different teams or groups. They track dependencies as well as transfers of information or products from one team to another. For this reason, they are a great Gantt chart alternative when you are working on a large project with multiple teams. 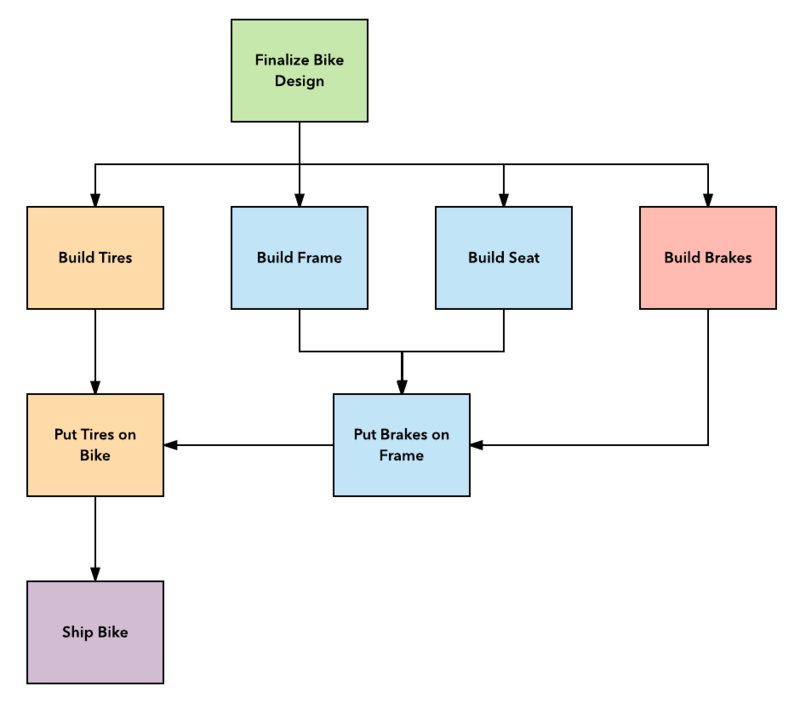 You can add detail to a cross-functional flowchart by layering horizontal and vertical swimlanes. One axis can show teams while the other represents time as in the example below. Once you have finished building your flowchart in Lucidchart, establish a single source of truth for your project by sharing it with all the teams and stakeholders involved. You can even control who is able to edit, comment, and view. Similar to a standard project timeline, a sprint timeline organizes projects chronologically by sprints. The format is very flexible and easily customized. Add more project boxes for separate teams or use a color scheme to layer in additional information. For example, in this template, the current sprint is highlighted in red. Using Lucidchart makes it easy for teams or individuals to access this document and add project details as needed. There are dozens of to-do list apps to keep you organized, or you could try building your own using a table. Use one column as the list and another as your checkbox. Fill in the box with a solid color when finished or type in the date of completion. You can also add columns for team assignments, due dates, and progress estimates as an alternative to Gantt chart progress bars. If you’re here because you don’t really need project management software, but you’re just not sold on Gantt chart alternatives, try using this simple Gantt chart template in Lucidchart. It’s much less expensive than your PM software and much easier to print and share than your PM software, but it still has all of your favorite Gantt chart features. Gantt charts can be complicated to understand and difficult to maintain, and they may not help you communicate effectively with your team members or work with the flexibility you need. Try using a few of these Gantt chart alternatives in Lucidchart. The software is free and will help you collaborate the way that works best for you. 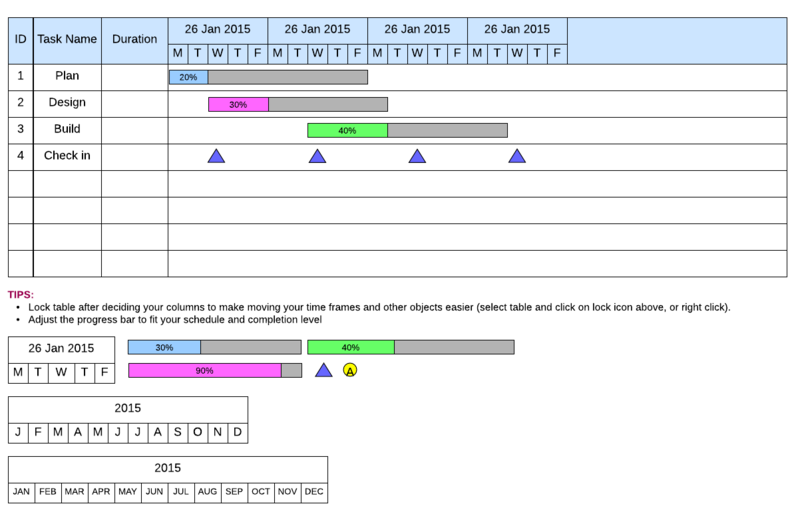 Already tried a few Gantt chart alternatives? Share your experience in the comments below.